My paternal grandmother made some killer refried beans (yet she was never convicted for murdering them). They were off-the-hook delicious! Tantalizing and tasty. You know how pinto beans are brown? Well, her beans turned out grey because of all the lard she used. (The one time that grey food is great food). Can’t complain too much. I’m a big fan of the piggy. Let’s be honest though. We can’t eat like that everyday. 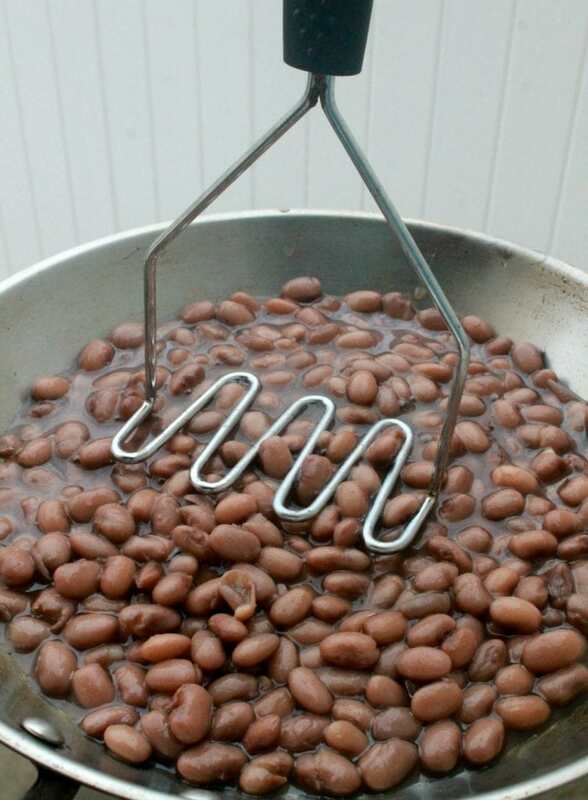 Here’s a simple vegetarian recipe for refried beans that won’t send you to the ER for chest pain. 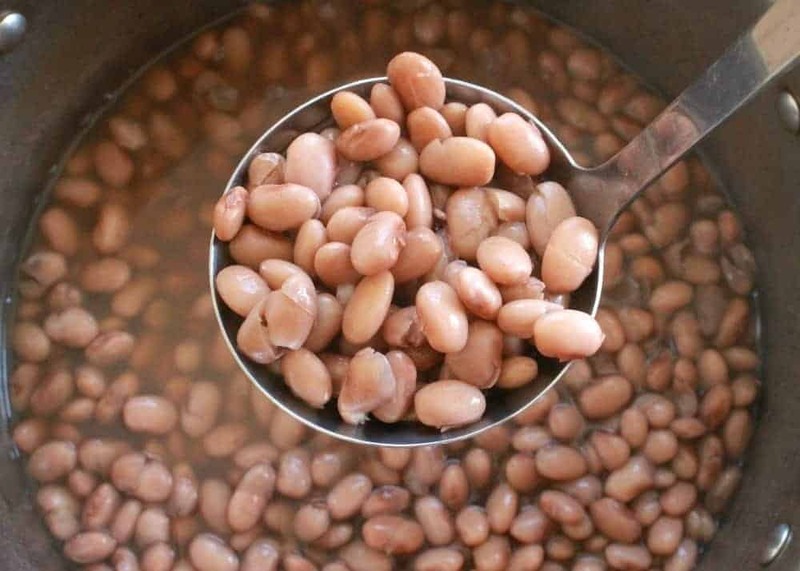 It all starts with the pinto beans . I know it takes forever to make your own and no one has got time for that. If you do because you’re a rock star in the kitchen, here’s my recipe. You can always buy a can of pinto beans . That is sacrilegious in my family, btw. Fresh is the only way as is most Mexican cooking. But, I’m not here to judge – There is no Judge Maggie (just Judge Judy). I was a single mom for many years before marrying The Hubs, and I still keep to some of my time-saver ways. There are so many dishes in Mexico using beans. After all, it is the magical fruit. 😉 It’s no wonder refried beans is a staple dish in our Mexican cuisine. “Refried” is a silly word, though, and please don’t take it literally. It doesn’t mean that the beans are fried twice. We fry the onion until translucent then mash them with a potato masher using the bean broth, or the juice from the cooked beans. The consistency is almost like a puree. Soft, yummy, and easy enough for a baby to chew. 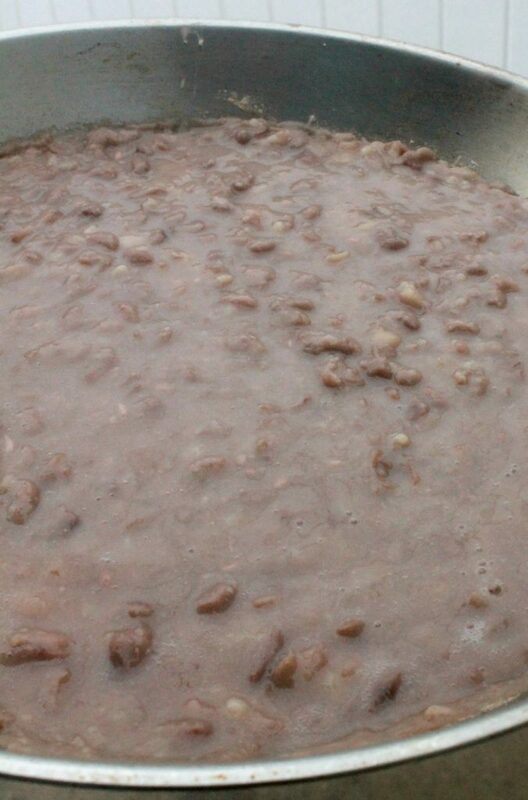 In fact, we often give refried beans to our babies as they start eating solid food. We eat refried beans as a side dish or a light meal with some tortillas. My mom would occasionally serve this as an appetizer with a little queso fresco and tortilla chips. I like to add fresh or pickled jalapeños for a little kick. However you like them, I’m sure you’ll enjoy this easy recipe. 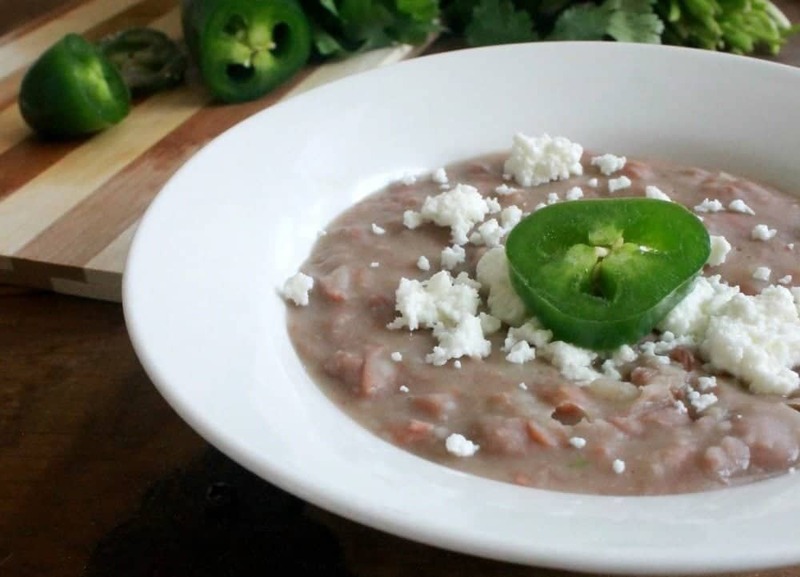 Homemade Refried Beans, or Frijoles Refritos, is one of the easiest Mexican foods to make. Vegetarian and yummy, they make the perfect side dish to any meal. Add the garlic and clove. Stir constantly for 1 minutes or until onion is translucent. Add the beans, the bean broth, cumin, and bouillon. With a potato masher, mash all the ingredients until the texture is like a puree. 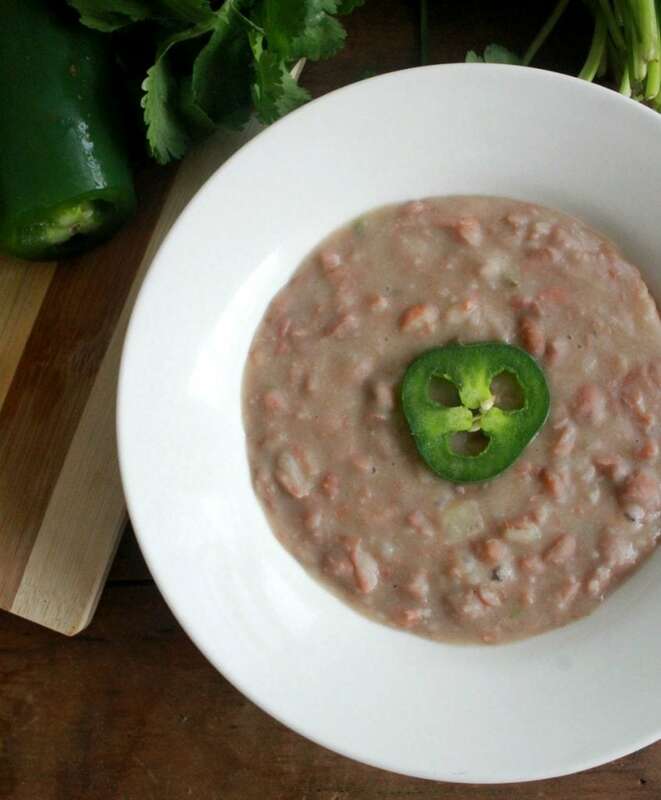 I’ve never attempted to make refried beans from scratch, but this recipe may just change that. I’m always looking for meatless dinner ideas, and this recipe would be great served with some warm tortillas and a nice salad. Thanks for sharing! So easy to make. Just makes sense to make them at home. Hope you try this out! I make my beans the exact same way. Cumin and potato masher and all! Awesome! great minds think alike. Wow, I had this last week itself, when I went to my aunt’s place. I don’t know there is something special about this dish. I cannot stop myself. I know it takes time to make it. but it takes very less time to eat it. Haha! I’ve never made my own refried beans; they look and sound delicious! We’re such fans of cumin in my house so I’m sure these would be a big hit. Will have to make soon! So easy to make. You’ll never go back! OMG, Love this recipe. Can’t wait to try. We’ve lived in San Diego for 20 years and I’m ashamed to say that we’ve never made beans at home before! Thanks for posting this, I may just try it this time.